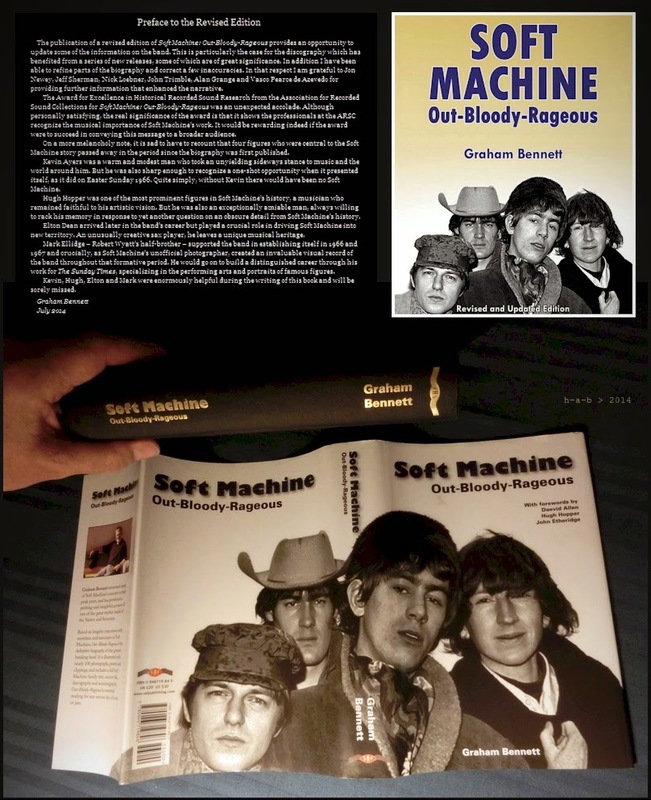 Tra i suoi mille altri impegni Graham Bennett ha finalmente trovato il tempo di rivedere e aggiornare il suo bel libro Soft Machine: Out-Bloody-Rageous, uscito nove anni fa per SAF Publishing, mai ristampato da allora e divenuto oggetto raro anche sul mercato dell'usato. Ne dà annuncio egli stesso a What's Rattlin'? anticipando migliorie e integrazioni apportate al testo - ora un ebook per Syzygy - anche alla luce delle numerose pubblicazioni discografiche successive all'ottobre 2005: "Well, it’s taken a couple of years longer than expected but the revised and updated edition of Soft Machine: Out-Bloody-Rageous is now available. Apologies for the delay. In revising the biography I’ve been able to refine the narrative, update the discography, add some new illustrations and correct a few inaccuracies. It’s also enabled me to clear my conscience, after promising repeatedly for five years that the revised edition was imminent. The economics of publishing mean that it’s only available as an ebook, which I hope you can forgive. The good news is that it’s about £140/$180 cheaper than the few remaining print copies of the first edition that are on offer from the internet sharks (and the seller called Bennett Books Ltd has nothing to do with me!). Hope you enjoy it!". Non manca nella nuova prefazione l'affettuoso saluto a quattro protagonisti centrali nelle vicende Soft Machine - Mark Ellidge, Elton Dean, Hugh Hopper e Kevin Ayers - che furono di grande aiuto a Bennett nella prima stesura del testo, e venuti purtroppo a mancare nel frattempo.